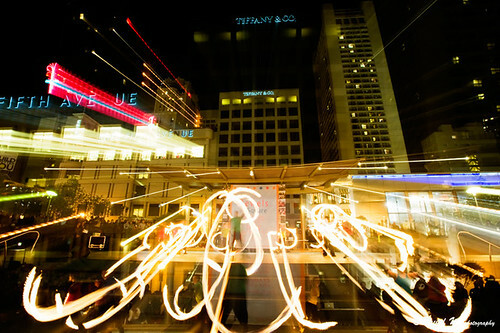 Above Image: Fire Dancers metaphorically ignite movement in Union Square, the center of SF commerce. Your customers are trading products and goods –rather than buying them from you! Do you want to know why? We’re conducting research in a pragmatic method to find out why. Then we will publish what companies should do to respond. Below is a preview of the upcoming report. I’m knee deep in interviews for the upcoming report on this topic, the Collaborative Economy, which will answer how corporations can be part of this sharing movement and not be left behind. In my previous post, I made the case that this is the next phase of Social Business. I have probed 200 startups from the sharing movement and have compiled a list of brands that are already participating, like Barclays, Toyota, BMW, and Wal-Mart. In the research interviews, books, and content I’ve digested, I’ve found some patterns relative to the causes of the movement. I don’t expect this to be a comprehensive list, and I request your additions in the comment section of this post. Population Density While also listed in Economic Drivers, denser population enables sharing to happen with less friction. Zipcar took off in urban San Francisco, where owning a car is impractical. Zipcar’s scattered storage lots give customers quick access to wheels, often walking distance. Mindset of Sustainability Greening, Cleaning, and Sustainability have been hot topics for years. This bolsters the need for economic conservation and long term thinking. Many of the startups we interviewed explained that this is about re-use or preservation of resources, rather than buying new products. Lifestyle Trend among Youth In Shareable Magazine’s book, Share or Die, Neal Gorenflo writes that this sharing mindset is common among college students who have limited resources. For resource-strapped students, Chegg enables students to trade textbooks, rather than buy at high margin bookstores. Social networking is part of their inherent behavior. Altruistic Mindset In some cases, gifting or paying it forward are common in this movement. See list of gifting startups. A recent UCLA poll found that over 75 percent of incoming freshman believe it is “essential or very important” to help others in difficulty, the highest figure in 36 years. Independent Lifestyle We heard from Molly Turner at AirBnb that many renters of homes found this service empowering. Their own homes were revenue generators for their independent lifestyle. Similarly, TaskRabbit advertises that their rabbits are: “College students, recent retirees, stay-at-home moms, young professionals,” enabling those who may not seek a full-time position. Increase in World Population China and India have population growth rates at 17% and 30%, respectively. America is at 22%. See Wikipedia. When I was born in the ‘70s, the world population was in about 4 billion; today it’s 7.1 billion. It is estimated to be close to 9 billion by the time I am 75 years old (data here). Economic Disparities Where there is a divide fixed between haves and have-nots, these sharing systems naturally seek to shift resources. For example, we saw a boost in Bitcoin value as Cyprus was under severe economic strain. Excess or Idle Inventory One of the root causes of this movement an abundance of idle resources sitting by the wayside that can be shared and often monetized. Rachel Botsman discusses in her iconic TED speech that the average usage of an electric drill is a mere 12 minutes per year. Inaccessible Luxury Those who can’t afford something, can now rent it. One successful Gen X banker told me that, “Access is more important than ownership” Why buy a $100,000 Lincoln Town Car, when you can rent an Uber for 30 minutes, saving money and headaches? Influx of VC Funding Venture capitalists have already put billions into this market of fresh new startups. Our research shows that there has been over $2 billion of funding across 200 startups. Category leader, Uber, has received nearly $50m of funding and AirBnb has received a whopping $120m. AirBnb in itself is a social network. They have seller profiles, and renters have their own reputation with verified IDs. The goods traded are locations. Payment Systems In the end, this is a marketplace of goods and services. Systems and platforms are required to broach the transactions that may use traditional ecommerce or new bartering methods TaskRabbit asks me to use my credit card, while other systems like Bittorrent are fueled by Bitcoins. So there you have it. 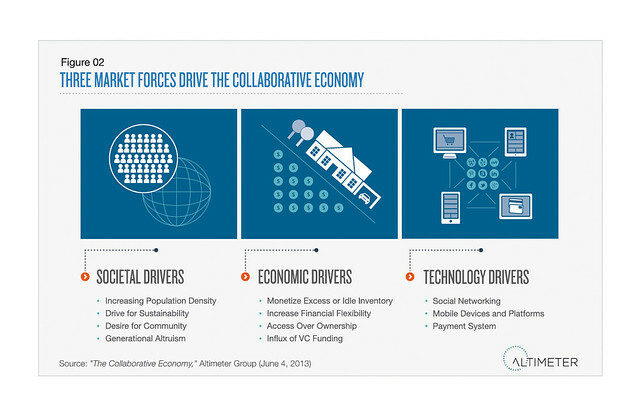 I see three categories and at least thirteen distinct drivers for the Collaborative Economy. Like social was to us in 2007, this is a broader movement that impacts many aspects of society and, therefore, business. If these market drivers are long-term (often social and economic ones are), then it means that this movement is likely to persist and to potentially increase in velocity. If you thought social business was disruptive, this next trend will impact us at a much deeper level. I’m not an expert on this topic, so instead, I’m interviewing those who are. Here are some of those who I interviewed for the upcoming report (full sources to be cited in report). I highly recommend following them to learn more about the impacts of this movement. Shareable Magazine: This forerunner has been tracking this movement for years. See founder Neal’s lifestyle. Lisa Gansky: Author who has a large database themed the Mesh; early pioneer. Collaborative Consumption: Famed author, TED speaker, this group is leading the charge. Sharing Economy Slideshare from Loic Lemeur, who’s leading the LeWeb conference with the theme on Sharing. Image Source: David Yu, creative commons license.